You'll enjoy the smooth, straight lines that give the Mission style furniture its lasting appeal for years! The corner design will help you make the most of your space. 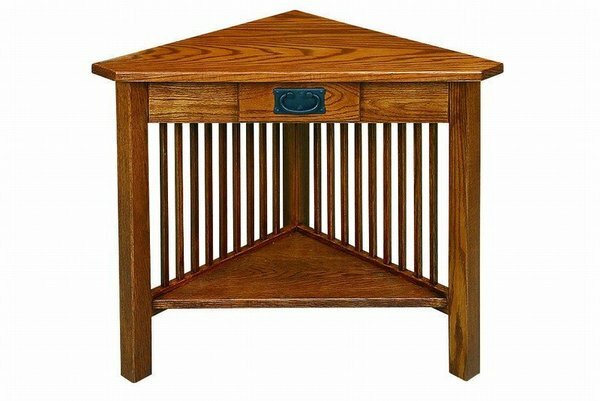 This beautiful Amish Mission Corner Table with Drawer is handcrafted using solid oak, brown maple, cherry or quartersawn white oak. Feel good about owning a piece of genuine American craftsmanship. The mortise and tenon construction and solid joinery methods that this corner table is made with will allow you to enjoy it for years to come. Be sure to take a look at our Amish Mission Jr Corner End Table for even more space-saving options for your living room. If you're in Florida, visit our Sarasota Furniture Store for an up-close and personal look at our handcrafted Amish furniture.